The Laguna 17 gram cage actually measured out to be 15 grams on the MTBR shop scale (click to enlarge). Laguna Bicycles is a fairly new company based out of Southern California with direct ties to a carbon bike factory in Taiwan. We recently reviewed their MR1 carbon monocoque hardtail with 27.5″ wheels. 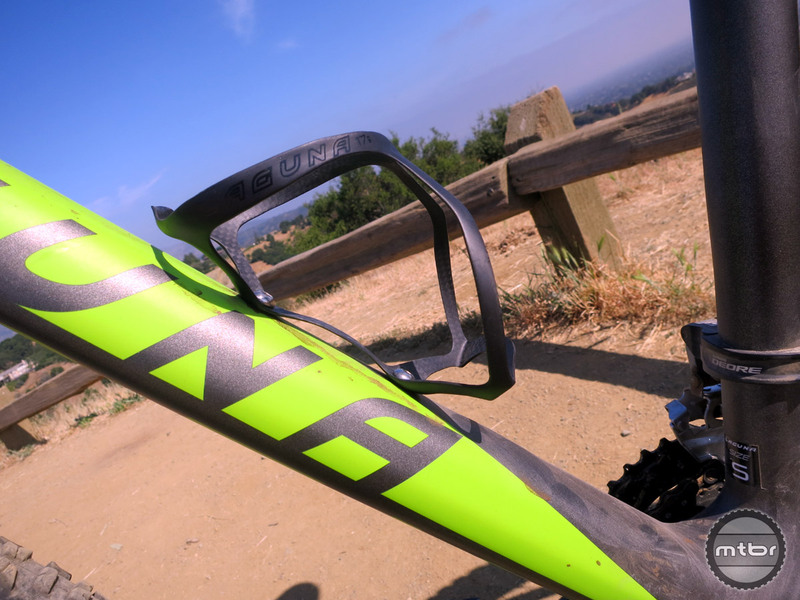 Although we felt the bike was a decent option for certain riders, it wasn’t a screaming deal and didn’t really stand out from the crowd of sub-$3000 carbon hardtails. However, the new Laguna 17 G Carbon Cage is a product we can get excited about! The cage is claimed to weight 17 grams or less and is made from a 3K weave, uni-directional carbon fiber. 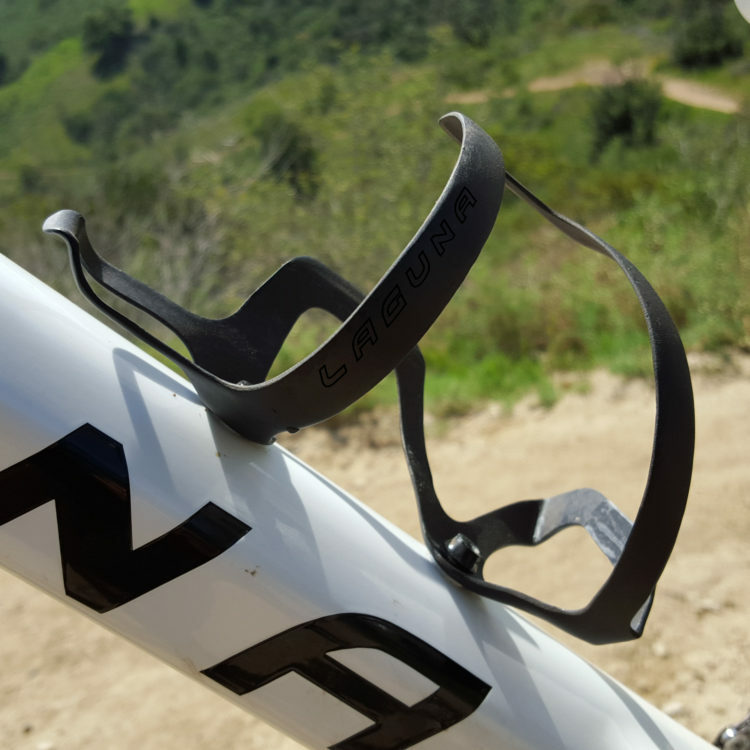 It is designed to work for both mountain bikers and road cyclists and it comes with 2 bottle cage bolts. The price of the Laguna 17 G Carbon Cage is $49.99. We weighed this cage on our parts scale and found it to actually weigh 15 grams! We were sent two cages for testing and both of them weighed in at exactly 15 grams. 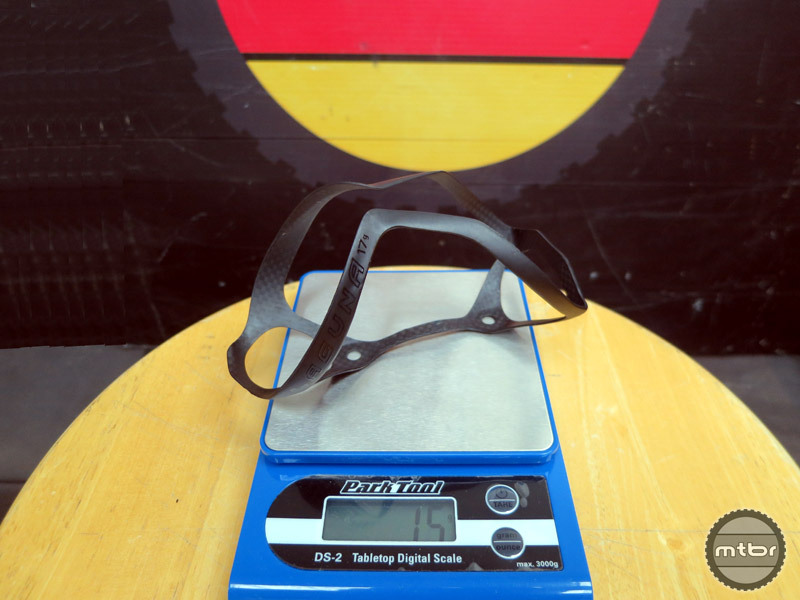 For comparison sake, we weighed our Lezyne CNC alloy cage that is claimed to weigh 39 grams and it weighed in at exactly 39 grams (see photo in the gallery below). During our initial ride, we experienced zero problems with ejections or loose bottles (click to enlarge). Lezyne Carbon Cage SL is 34 grams and costs $59.99. King Cage Titanium Cage is 28 grams and costs $60.00. Arundel Mandible Carbon Cage is 28 grams and costs $69.99. Specialized S-Works Zee Cage II is 28 grams and costs $60.00. Tacx Uma Carbon is 19 grams and costs $79.99. Elite Leggero Carbon Cage is 15 grams and costs $74.99. We have heard of a German brand with an uber light cage, but that one comes with a recommendation to not use it for racing. The Laguna 17 G cage has no such restriction and is much sturdier by design. So, you can see that by comparison, the Laguna cage is not only lighter, but it costs much less than anything in its class. Mtbr: It seems you guys have built quite a quality cage here. Pham: Yes, we are really excited about these and would love your feedback! We feel they really are the lightest and best performing cages ever. They were developed in endurance mountain bike races yet, they are light enough for the high end roadie market. Mtbr: It says full carbon, so no metal at all inside? Not even reinforcements around the bolt holes? Pham: Yes it is full carbon, even around the bolt holes. Mtbr: How do you get the carbon to be flexible? Pham: It all comes down to the orientation of the carbon layup. Each cage is precisely laid up with as much care as a high-end frame. 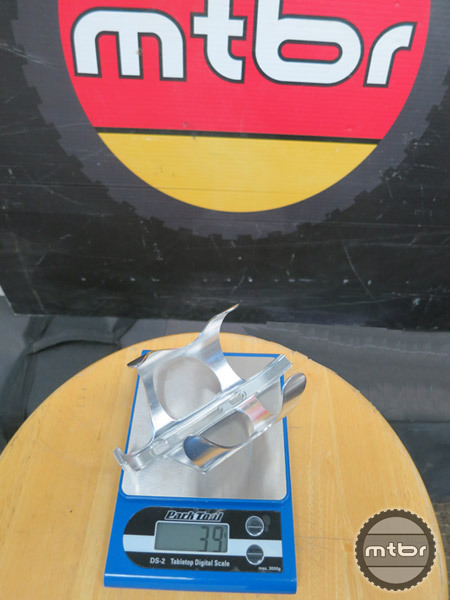 By optimizing strength, stiffness, and flexibility through proper layup, we are able to produce a lightweight cage that is also strong and easy to use. 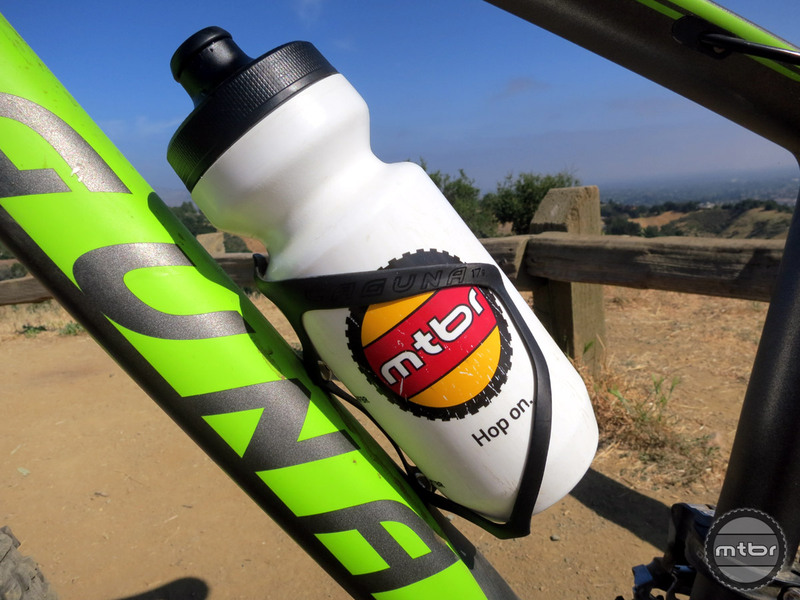 Mtbr: What kind of warranty comes with the cage? Pham: The Laguna 17 G Carbon Cage comes with a 2 year warranty. The Laguna 17 gram carbon cage comes in two color choices: black carbon with black highlights or black carbon with red highlights (click to enlarge). We just received these cages this week and we were so excited we installed them and used them right away. Initial impressions are very good as the fit and finish are top notch. Inserting and removing a water bottle is simple and easy and we experience no ejections or problems. We haven’t ridden anything super bumpy or technical yet, but we can tell from the design that this most likely won’t be an issue. Stay tuned for our long term test as we use these cages on our mountain bikes and road bikes and test for durability and usability. The Laguna 17 G Carbon Cage is available now directly from Laguna Bicycles via their website. It comes in two colors: carbon black with black and carbon black with red. Laguna also makes a 20 gram side load version for the same $49.99 price. During our initial ride, we experienced zero problems with ejections or loose bottles. The Laguna 17 gram carbon cage comes in two color choices: black carbon with black highlights or black carbon with red highlights. The Laguna 17 gram carbon cage has a nice finish on the outside and a raw carbon fiber finish on the inside. The Laguna 17 gram cage actually measured out to be 15 grams on the MTBR shop scale. The Lezyne CNC Cage weighs in exactly at the 39 grams that the company claims. A view of the 20 gram full carbon sideload cage from Laguna Bicycles. How about the Blackburn Slik cage for $11 at 22 grams? Hey dan, that Blackburn looks like a good option, but they are listed at $15 and 23 grams (http://www.blackburndesign.com/slick-racing-bottle-cage.html). Looks like Blackburn does have an uber light cage at 16 grams, but still $59.99 (http://www.blackburndesign.com/cages/cinch-carbon-fiber-cage.html). Last 4 slik cages I’ve purchased were $11 each and averaged 22 grams. Didn’t know about their 16 gram $60 cage. I’ve always wondered what fiscally liberal rider purchased these expensive weight weenie cages. Last week: my cousin showed up on group ride with a $60 cage! God bless American capitalism! When I see stuff like this, I really hope it’s sarcasm, but I’m never really sure. Spending $75 on a bottle cage, to save <10g compared to $10 plastic cage… I'm not exaggerating when I say I am unable to think of a less worthwhile use of money or effort. Why do we care about 16 vs 28 grams for something designed to carry 1 kilogram of water?